Certain graphical effects are only available when using Direct3D whilst others only available with OpenGL. Also post-processing injectors typically cause heavy artifacts and graphical glitches. The European release of the Hitman Collection is DRM-free, already patched to the latest version and have the cheats enabled by default. Patch v1.74 is the latest retail patch. Digital distribution versions are v1.75 only in Steam and comes with other languages support and widescreen support. Find the following line and replace it with the this value. Vert- in Steam version. See Widescreen resolution. See Widescreen resolution or the WSGF entry. Force in GPU control panel for better results. Nvidia cards can force AA using Nvidia Profile Inspector. 0x000020C0 for MSAA and 0x000000C0 for SGSSAA. Ensure the AA fix is enabled. The game doesn't run properly at very high frame rates. Steam version supports widescreen (including 4K Ultra HD) natively, but it features a problematic Vert- FOV change, as well as stretching game graphics. Extract h3.7z files to <path-to-game> (password=h3). Edit h3.ini to set the resolution and FOV multiplier. Works with Steam/digital distribution versions; supported exe size: 3 752 004 bytes; 3 756 135 bytes. LOD distance is also adjustable. Add Window 1 on a new line. Change StartUpperPos 2,2 to StartUpperPos 0,0. May require DirectSound3D restoration software to restore proper sound functionality on Windows Vista and later. 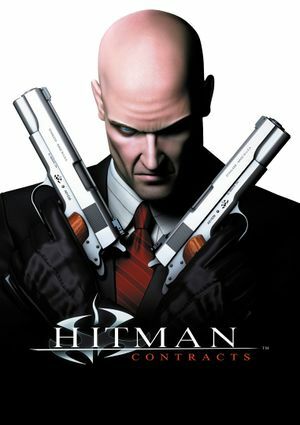 See Helix Mod: Hitman: Contracts. Make a new folder and name it "Save". 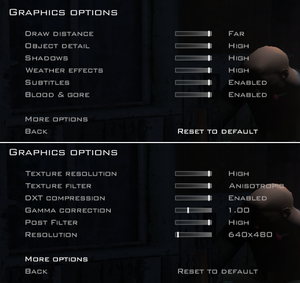 Some users reported that this can be fixed by lowering the "post filter" that is for modern graphics cards. Try to mute the in-game music -some users have reported this fixed their problem. Try turning off post filtering. Disable EAX in sound options. ↑ 2.0 2.1 File/folder structure within this directory reflects the path(s) listed for Windows and/or Steam game data (use Wine regedit to access Windows registry paths). Games with Steam Cloud support may store data in ~/.steam/steam/userdata/<user-id>/247430/ in addition to or instead of this directory. The app ID (247430) may differ in some cases. Treat backslashes as forward slashes. See the glossary page for details.